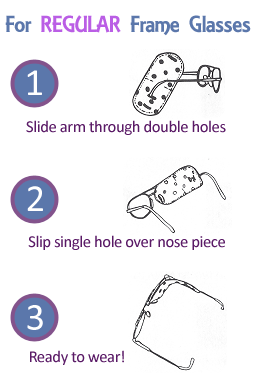 The Perfect Eye Patch is a reusable, home-made cloth eye patch most commonly used to treat Lazy Eye (Amblyopia) in children. This comfortable eye patch comes in three different sizes to fit adults, children, and infants and is designed to easily fit all glasses. We offer convenient, secure online ordering and accept payment using PayPal. We also accept phone orders paid by credit card, cheque or money order, call 1-(780) 777-7232. 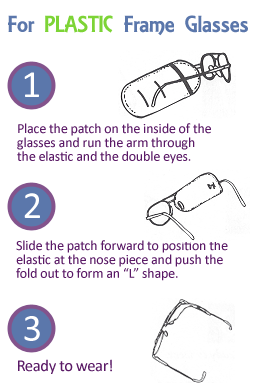 There are two types of eyeglass frames that our comfortable cloth eye patches will secure to – a “regular” frame with a detached nose piece (not part of the frame itself but screwed in place), and a “plastic” frame where the nose piece is an integral part of the frame itself. Please make sure when you order cloth eye patches that you are selecting the right category for the type of frame you are using. The SKU will end in a “P” for Plastic frames and end in a number for regular frames. COST FFECTIVE ~ Less expensive than alternative eye patch products. NON ADHESIVE ~ No adhesive to irritate the sensitive eye area. BREATHABLE ~ Allows air to circulate around the eye. NON-ALLERGENIC ~ Great for sensitive skin. COMFORTABLE ~ Stays in place and eliminates the desire to be removed. THREE SIZES ~ Adult, Child, and Infant sizes. CONTOURED ~ Avoid vision through sides, top and bottom of patch. When he was diagnosed with Ambloyopia (a lazy eye) we learned that he would have to wear corrective glasses and an eye patch for several hours per day. 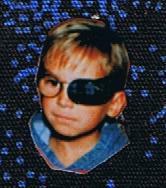 As his parents, we spent a great deal of time and money in our search for an eye patch that wouldn’t irritate his skin and yet stayed in place. We ended up with a drawer full of adhesive patches which irritated his skin, tore out his eyebrows when removed, and had to be replaced every time he shed a tear or got an eyelash in his eye. 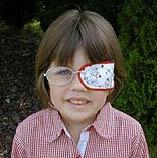 We also had pirate style patches that topped off every time moved his head, foam eye covers that he could peak out of, and plastic patches that didn’t fit under his glasses. Understandably, he was frustrated with all of these and was forever taking them off. We soon realized that patching can become quite unpleasant to say the least. 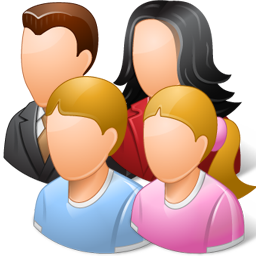 We created this website in the hope that you can use our frustrating experience to avoid having one of your own.